Resignation Letter is a formal letter that is written by an employee to its seniors or concerned authority for informing about his/her resignation. Most of the companies demand for a 2 week prior notice before resigning from a job and therefore a resignation letter with professional format and polite language is required to communicate reason for resignation and other important details. The letter isn’t used just for informing about the resignation but also act as a document of evidence that proves your resignation from a certain company. 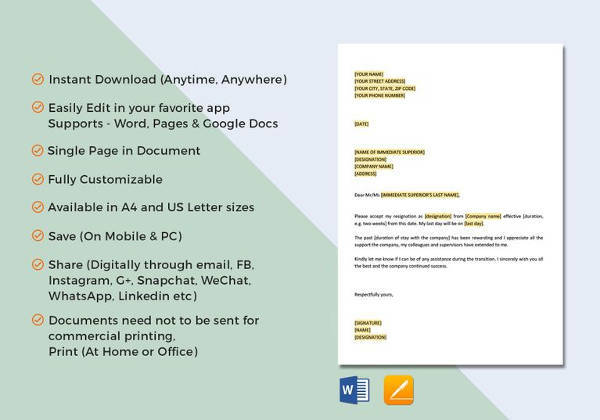 The Resignation Letters 2 Week Notice templates are easily available online in Word and PDF format. 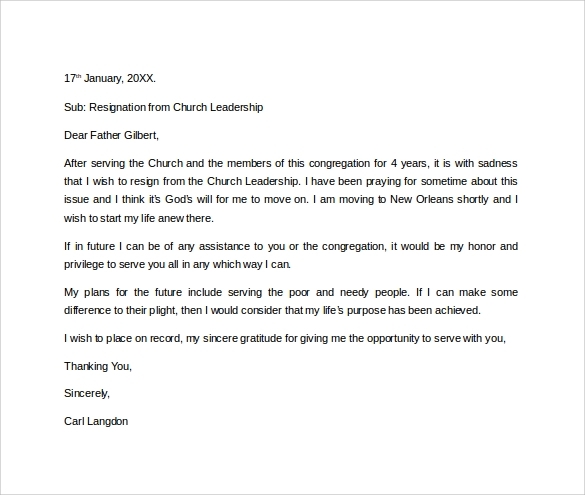 This simple resignation letter covers all important information that needs to be covered when writing a resignation letter to the higher authorities. The letter is divided into three parts where first part covers information like your name, current address, formal salutation and the next part will cover proper reason of resignation and the last part will be formal closing of the letter. 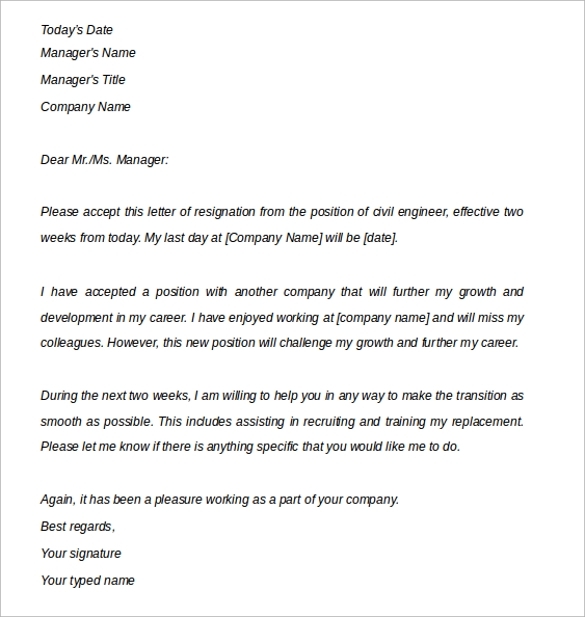 This kind of resignation letter as the name suggest is best suited for the employees of engineering industry. The letter covers all important information that is valuable for future use like your name, your designation, company’s name, reason of leaving the company, duration of the job etc. in a professional and graceful manner. 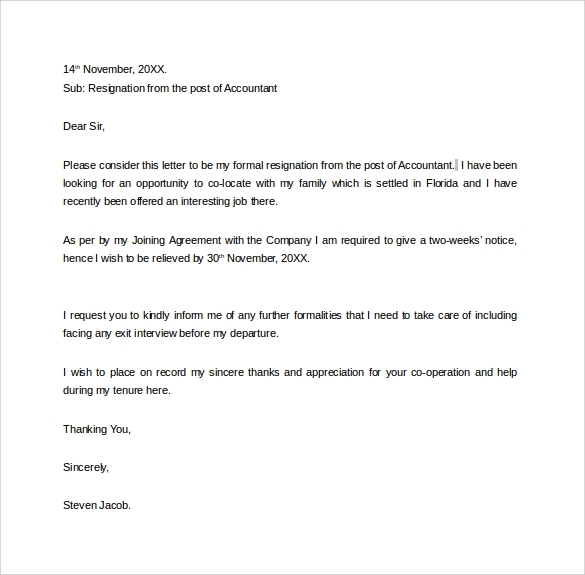 Addressing to the concerned authority this resignation letter format is best two weeks notice example for employees. 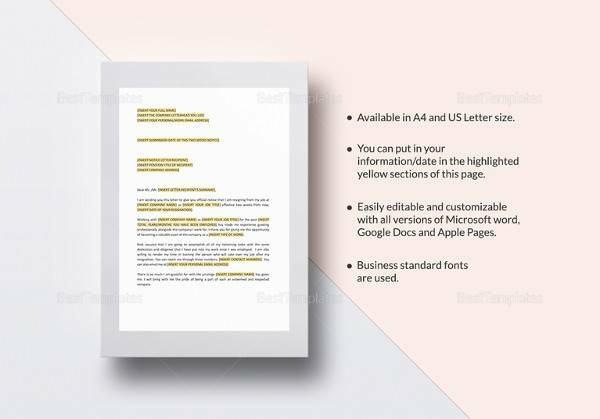 This sample letter can be downloaded for free online and can be edited according to your requirements. The samples are available in both Word and PDF format for easy previewing and editing purpose. The core Purpose of a resignation letter 2 week notice template is to give you an idea of the correct format of a letter, the professional language that should be used and important information that needs to be covered before handing over the letter to the concerned authority. The format and language of the sample resignation letter 2 week notice changes according to the industry it is being addressed to. For instance the language and format of an engineering resignation letter notice of 2 weeks will be different from 2 Week resignation to university in language and format. One must choose the best resignation letter that covers all important information about resignation and has a professional appeal that suits the industry to which it is being addressed to and is gracefully written. 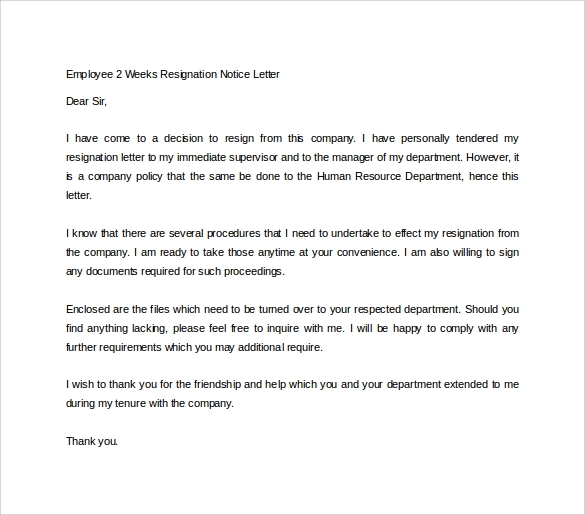 The sample resignation letter 2 week notice is simple resignation letter that is best used by employees who wish to formally convey reason of resignation to their seniors or to the HR department. The Formal Resignation Letters provide them an idea of the format, language, font style, important aspects to be covered and other minute details that make resignation letter a convincing as well as impactful one. 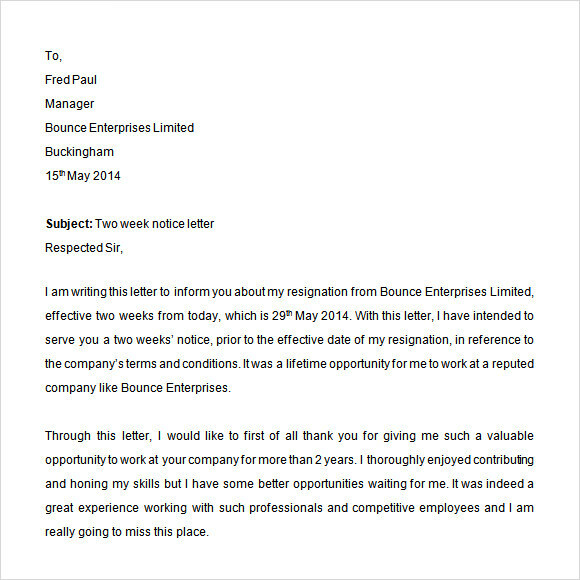 The resignation letter also acts as an important document that will be required in the company that you join next. Therefore, the resignation letter must cover all important information such as your name, name of the current company, valid reason of leaving the company, duration of the job etc. 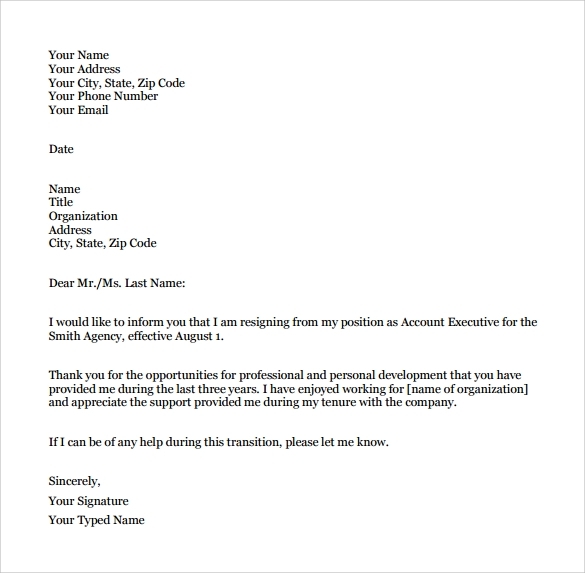 The benefit of sample resignation letter 2-Week Notice Templates is that you get an idea about the format and language of the resignation letter. With sample letter you will know the flow of text that needs to be written for a formal resignation letter. A simple resignation letter will cover major aspects like respectful salutation, valid reason for resignation and respectful closing of letter. If a resignation letter is written professionally and in a language that is polite yet impactful. The process of resignation gets simple and quick. 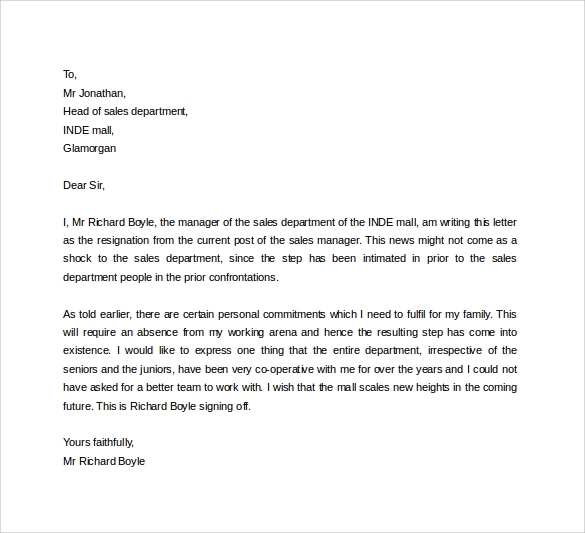 Sample resignation letter 2-week notice period are easily available online for free download. One can choose from various formats according to the industry, format and language that suit the best for informing the designated authority about the resignation. 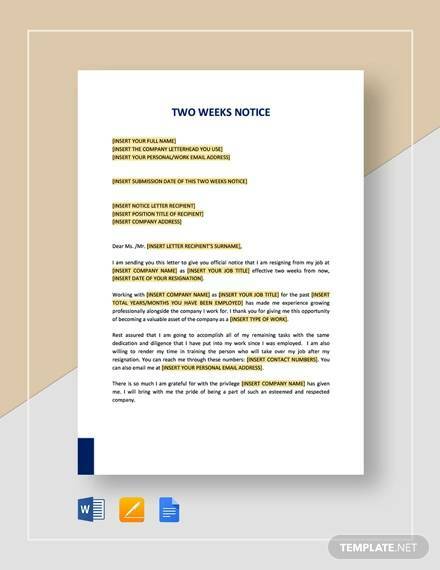 The sample resignation letter 2-week notice period is an easy way to convey the resignation information to the higher authorities in a formal and convincing manner. 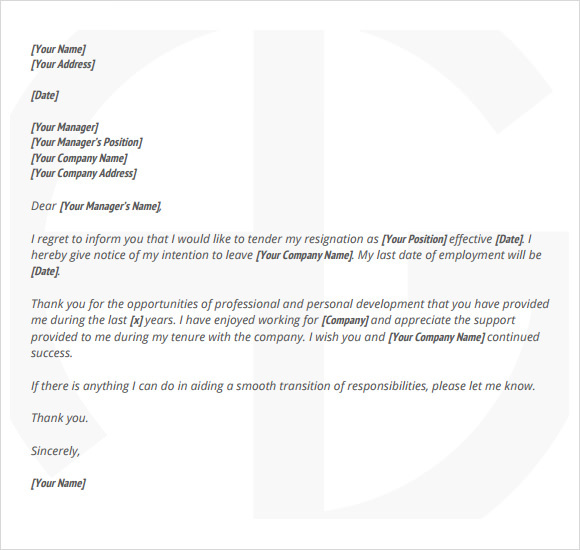 The samples resignation letter 2 week notice PDF and Word format is easily available online for free download. One can download it and edit it according to their need and requirement.